One of a kind Panel Qum design rug, 100% Handmade in Pure Kashmir Silk on Silk. 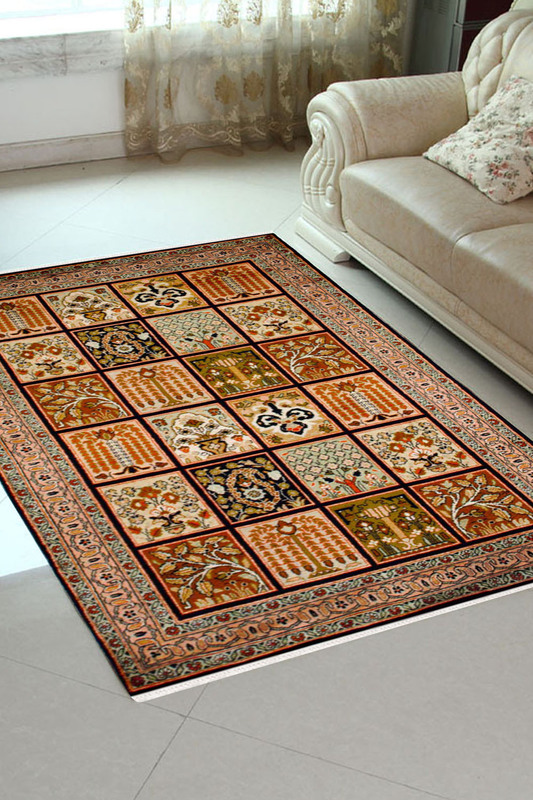 Vibrant colors like Soothing Gold and Soft Orange are dominant in this rug. Very intricately woven, it has taken 6 months to weave this rug by our skilled artisans. Easily Washable and High maintenance required. - Stunning design with extremely detailed craftsmanship. - Design is Panel Qum with an intricate pattern and intricate pattern. - It signifies motifs of Panels used in late 14th Century. - It has a thin layered Peaches Orange border with an intricately woven design. - It has taken 6 months to weave this rug. Primary colors are Soothing Orange-Gold and Bottle Green. - The Box-type Design Pattern represents craftsmanship prevalent in Qum which is 100km South of Tehran.